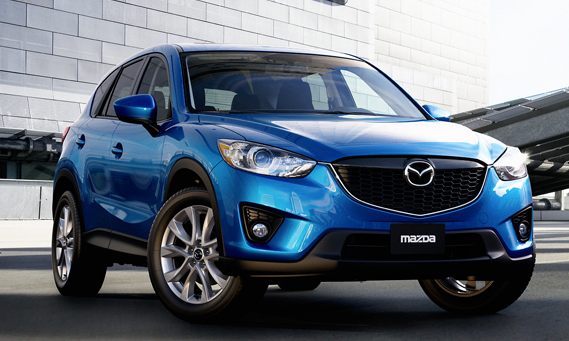 Not only is the 2014 Mazda CX-5 GS a leader in its class, it has made its mark in the automotive world. The new SKYACTIV Technology has made this vehicle lighter, faster and more efficient. The 2014 Mazda CX-5 GS is a stunning machine. It is equipped with a lift-gate garnish, rear roof spoiler, LED lights, a wide stance, chrome in all the right places, rich colours and body-coloured door handles. Inside the 2014 Mazda CX-5 GS, it’s full of refined and functional features like premium cloth upholstery, power glass moonroof, driver centred instrument panel and steering wheel mounted cruise and audio controls. It is all about the driving experience when it comes to the 2014 Mazda CX-5 GS. New for 2014 is the 2.5L SKYACTIV-G gasoline engine which offers even more power and efficiency. Winner of some of the most prestigious awards in the automotive industry, it has been name 2014 Auto 123.com Compact Utility of the Year and has been given a 2014 Top Safety Pick by the IIHS. The 2014 Mazda CX-5 GS is packed with all new power and safety options you could ever want.